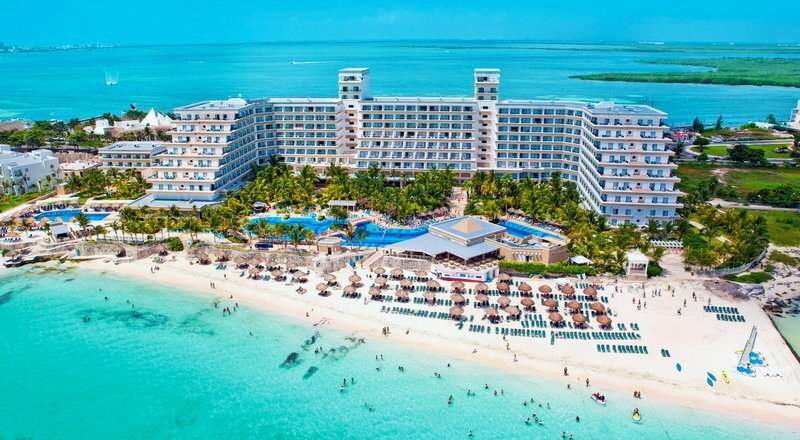 The Hotel Riu Caribe is located in the hotel area of Cancun, Mexico, in a beautiful seafront location with a beach that has turquoise waters and fine sand. This complex includes all the facilities you would need for a wonderful vacation. You will find two tennis courts, two fresh water swimming pools, one with a swim up bar, a diving pool, a solarium-terrace, a gym, sauna, steam bath, Jacuzzi and the “Renova Spa” wellness centre for all your pampering needs. RiuLand mini-club for kids of ages 4-12 where they can enjoy doing crafts and other activities with other children. For the adults if you want to dance the night away you can go and enjoy the Pacha club. The RIU Caribe has 506 rooms which have been completely renovated with a contemporary style. All rooms have a patio or french balcony, safe, mini-bar, liquor dispenser. Wi-Fi is available for a fee in the room however it is free in the lobby area. The hotel has 4 bars and 4 restaurants, the main buffet restaurant, and 3 a la carte restaurants where reservation are required, Grill and steakhouse (à la carte),”Maria Margarita” Mexican restaurant (à la carte; buffet starters and dessert), “Shangri-la” Asian restaurant buffet.